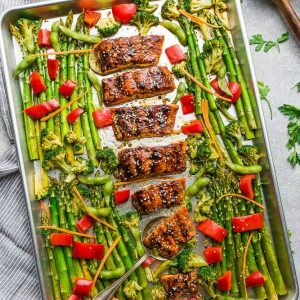 Sheet Pan Teriyaki Salmon with asparagus, broccoli, red bell peppers, and carrots - the perfect easy weeknight dinner recipe. Best of all, easy to customize with low carb, keto options and takes only 30 minutes to make – skip the takeout! In a medium saucepan over medium heat, whisk together soy sauce, honey, vinegar, sesame oil, Mirin, garlic, ginger, cornstarch, and water until combined. Bring to a simmer, stirring frequently, until sauce thickens and bubbles. Remove from heat and set aside. Preheat oven to 400°F. Lightly coat a large sheet pan with cooking spray or for easier clean-up - line pan with parchment paper or foil, set aside. Arrange the asparagus, broccoli florets, carrots, edamame in a single layer on the sheet pan. Season with black pepper and drizzle with 1/4 teaspoon of sesame oil and teriyaki glaze and toss to coat. Bake in preheated for 10 minutes. Remove pan from the oven, flip and push the vegetables to the side. Arrange the salmon fillets in the middle of the pan. Season salmon with salt and black pepper then drizzle 1-2 spoonfuls of the reserved over each piece, coating well. Reserve more sauce for drizzling later. Return pan back to the oven and cook for another 12-15 minutes (this depends on the size of your salmon) or until tender and flaky and vegetables are done to your liking. (increase cooking times if you prefer your vegetables more tender). Remove pan from oven and drizzle with remaining sauce. Serve over your favorite sides and garnish with green onions and sesame seeds, if desired.